"Yoga has had a profound cleaning effect in me, within the physical plane it is very obvious, I learned to perform neti pot nose cleansings, to do stomach churnings, I can’t wait to have a colonic..."
Okay, I'm totally with you about enjoying a sense of community, which I don't get when I work out alone. And I'm very thankful that I no longer get intense back spasms when I'm working at my computer. Maybe I'll even be able to get through a riding lesson one day without my 'tricky hip' pointing my toe in a weird, incomprehensible angle that confuses my horse. But when it comes to the fact that someone has had a colonic irrigation, the phrase 'thank you for sharing' leaps to mind. Trust me, I'm not saying I'm above the physical world, and maybe I've studied too much Victorian literature. But some things, I think, are best left to you and whatever weird health websites you Google when you experience digestive discomfort. I realize I'm probably alone in these sentiments, given that so many cereal boxes proudly proclaim their massive fiber content. Go! Have that hamburger, because only one bowl will completely purge you of all the toxins you ingest! How I miss the cartoon characters of my youth when I see cereal boxes such as this one! 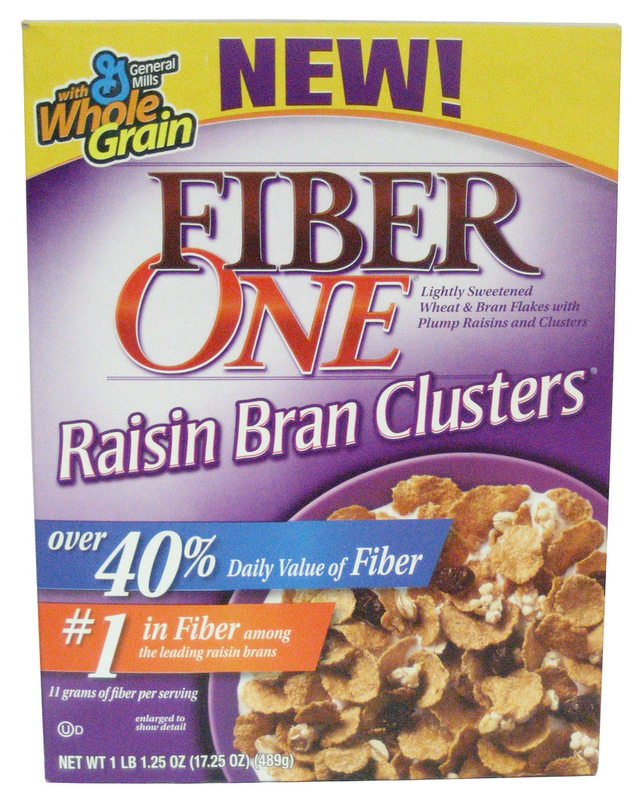 This is just a very good low-fat raisin bran recipe. It's not crazy decadent with cream and Plugra, and it's not made with twigs and psyllium husks. It's not the Master Cleanse. It doesn't make you think of that old Saturday Nigh Live sketch for Colon Blow (a mythical product that is beginning to resemble the modern marketing of cereal far too closely). 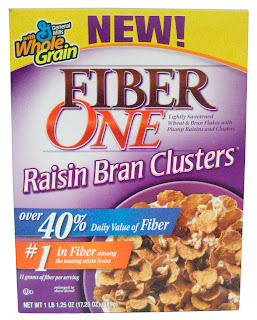 It's just a nice, tasty way of getting your raisin bran fix without lots of high fructose corn syrup (ahem, Kellogg's) but doesn't make you feel as if you're engaged in penance, rather than eating pastry. 4. Sift the flour, bran, baking soda, and cinnamon together. Fold the dry mixture into the wet mixture. 5. Lightly flour both kinds of raisins, to prevent sinking (this is especially important if you are using a muffin tin). 7. Bake for 15-20 minutes until the top is crackly, but the bread is still soft and springy to the touch. 8. Cool. If using a pan, cut into 8-12 slices. I recall slurping down strawberry-flavored Slim Fast, chewing on the McLean, eating Healthy Choice French Bread pizzas 'cheese first,' and many, many slices of Weight Watchers cookie dough-flavored desserts. I consumed Tasti-D-Lite as if it was a food group. Not coincidentally, like many people who survived on low-calorie snacks, my weight climbed the more diet foods I consumed--because the more I ate them, the less satisfied I felt. (And there is even some scientific evidence that eating artificial sweeteners can slow down your metabolism, which confirms what I always suspected, when my weight refused to budge even when I wasn't overeating due to a aspartame-fused craving). I have never begun a diet in January (I find the cold winter so depressing that just going through the motions of life can be dispiriting on some days). But as an adult, I am always trying to eat more healthfully--plus pretty much all of my friends are on 'New Year's Resolution' diets right now, even those with the metabolisms of jackrabbits. So a lowfat, diet-friendly treat seemed called for. These brownies are extremely low in fat, and even a generous 'cut' of the pan yielding 8 servings will give you a brownie of approximately 250 calories. Even more importantly, they contain no artificial ingredients. 1.Preheat oven to 350F. Line a 9 or 8-inch square or round pan with parchment or foil. 2. Melt chocolate in the microwave or over a simmering pot of water using a bain-marie. The chocolate doesn't have to be liquid, but it should be soft. Mix in the applesauce with the melted chocolate, then fold in the sugar, beaten eggs, flour, vanilla and salt. 3. Bake for 30 minutes, until still slightly 'underdone' in the center. 4. Cool for an hour--resist the temptation to dig in! Chill OVERNIGHT in the refrigerator. I stress the OVERNIGHT component very strongly. A general tip for ALL lowfat baking--quite often, the baked goods are much, much better the day after, especially when chilled. I've heard various explanations for this, but it does seem, based upon my experience, that the flavors have a chance to 'settle' a bit, and the flour is better able to absorb the ingredients. When I tasted these after 1 hour of cooling and 1 hour of chilling, I thought they were just 'okay' but after an overnight chill, I though they were quite good. And I even tasted one or two 'leftovers' from the freezer, and thought that this gave them an additional, nice fudge-like consistency and flavor.